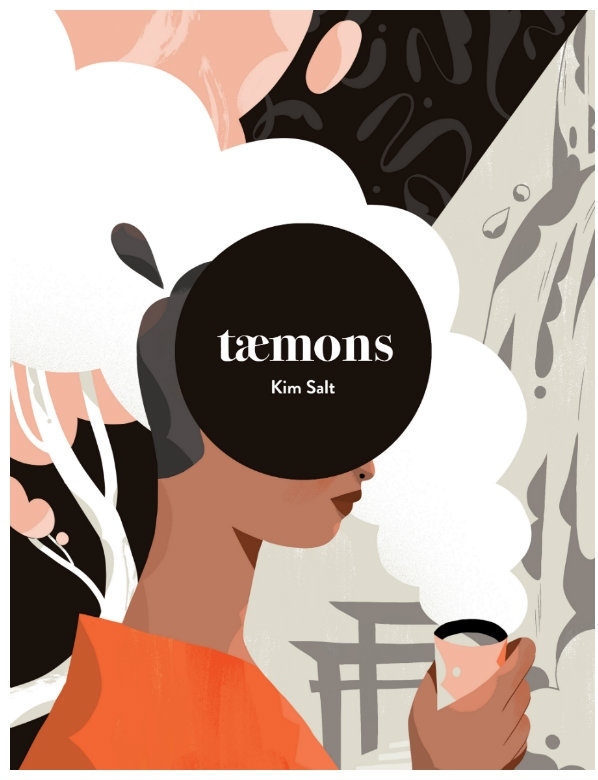 Published as part of last year’s ShortBox #9 collection, Kim Salt’s TAEMONS employs its intimate themes of self-discovery to flex the boundaries between reality and fantasy. Adding to the immediate quirkiness of the comic, Taemons’ definition of reality itself is enjoyably blurred. Taemons tells the story of a nameless woman’s journey into untangling her introversion via an app, one that quite literally pits her against her inner demons. It’s a pleasingly quirksome take on the well-tread trope of traveling to another world as a metaphor for inner reflection. Color is integral to Taemons’ separation of the real and the unreal. 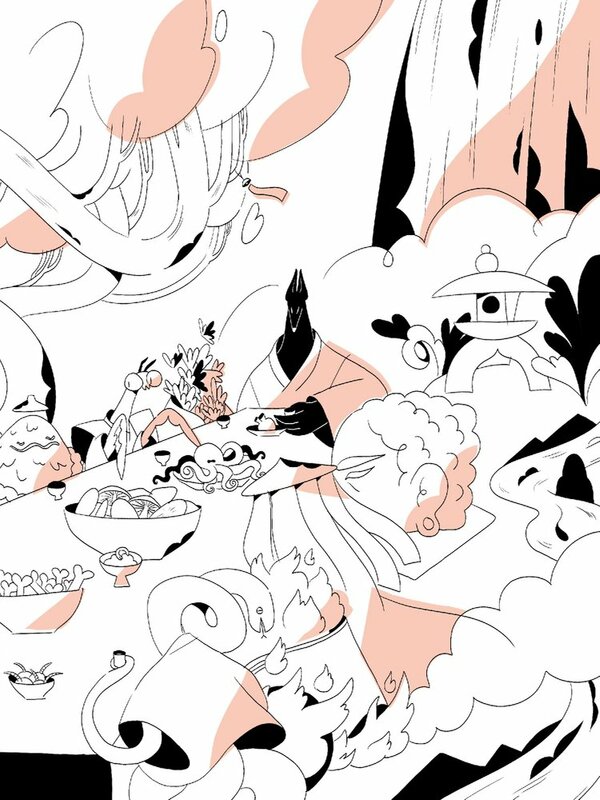 Salt depicts the true world in black-and-white, while she illuminates the fantasy world the main character is escorted to in a tense shade of orange as if to highlight the urgency of the world she’s placed into. Demons and aliens populate this world. Shape is a factor as well; Salt creates the fantasy world with a riot of curves, from the creature within to the table and chairs they sit at alike. Even the steam radiating from the tea is a billowing mass of untamed form. Counteracting this is how Salt depicts the real world. 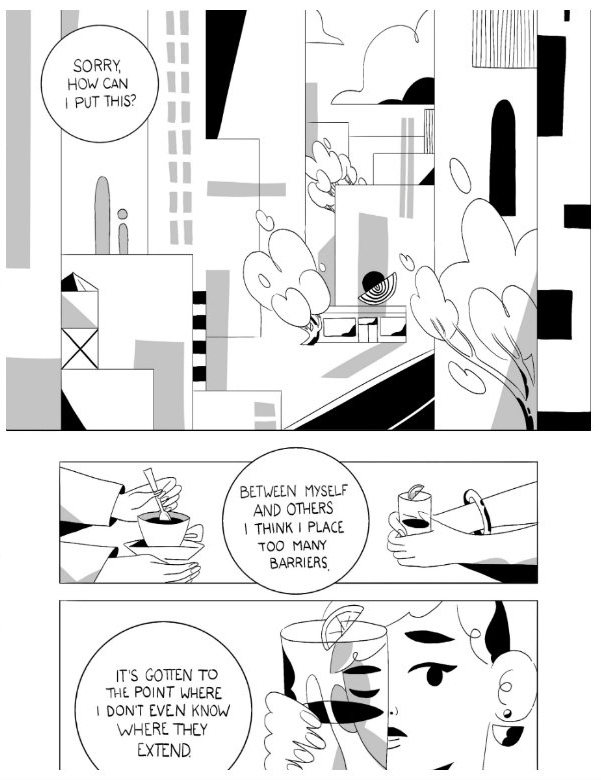 Salt places the panels of the comic into the very architecture of the story’s landscape. Buildings and walls become snapshots of the characters’ lives, containing flashbacks to their pasts. Happy, sad, thoughtful, their lives are condensed into the very structure of their world. It’s as if the monochrome color scheme is there to reflect the drabness of the main character’s life, yet the meta-esque breakdown of paneling reads like an inner probe of her own confused mental state. The swirling state of the fantasy world becomes a much deeper probing, an active exploration of her mental state, compared to the passive, immovable structures of the real world. There’s a taut sense of confidence in the symbolic nature of Salt’s artwork. It leads to an emotionally precise read that offers a firm grip on its journey. Elsewhere, the story Salt tells is a little more heavy-handed and less subtle than the story it shows. Taemons shows its emotions and ideas with cool, youthful clarity. However, things become sticky when it attempts to communicate those feelings verbally. The dialogue between the main character and her friend, who introduces her to the "Taemons app", feels clunky, almost heavy-handed. The reader already understands the disconnect the heroine feels via her internal monologue and the gorgeously inventive panel structures. The overall result is Taemons’ unintentional emphasis on its own inquisitive visuals acting as the comic’s strongest elements. However, the dialogue in the comic remains sincere in its confirmation of the book’s wider themes. That sincerity spreads to the characters themselves. They’re introspective, self-aware of their own broken-down emotions. Salt’s evocative artwork may open the door, but it’s the characters that make us step through into Taemons’ world. Salt writes her characters with a touching keenness about them, how they’re not afraid to confide in each other, wanting to untangle themselves, and taking the necessary steps in doing so. Or rather, in Taemons’ case, taking the necessary sips of tea. That delicate touch of personality gives Taemons a sense of immense scale when placed next to its quirky, all-encompassing visuals. Taemons’ climax provides further emphasis on its eloquence by showing rather than telling. Trapped in a far-flung world and verbally toyed with by her demons, the main character initially bows down to her hosts, an added slice of sincerity on her part. However, her submissive attitude evaporates as her turmoil in this strange land continues. Knife in hand, she leaps from her position at a Mad Hatter-esque teatime and lunges for her metaphorical self. Salt illustrates this burst of confidence via a handful of evocative splash pages that place her nameless protagonist firmly in the center of focus. This burst of confidence mellows into tenderness when the character unmasks her demons and discovers she is fighting herself. Taemons concludes with an open-ended scenario, displaying the lead’s now more rounded awareness of her own issues, while also acknowledging the long road ahead that she needs to take to overcome her difficulties. This open-ended attitude gives Taemons a sense of maturity in how it doesn’t need to provide a clean, happy ending for all concerned. Perhaps the greatest compliment one can pay Taemons is how it shows that mental health can be an unexpected journey with little end in sight. As the main character’s journey demonstrates, it can be no easy route, often fraught with chaotic bends in the road, with the destination being a better understanding of yourself. In fact, the main character’s uncovering her disguised self is the closest Taemons comes to a happy ending. 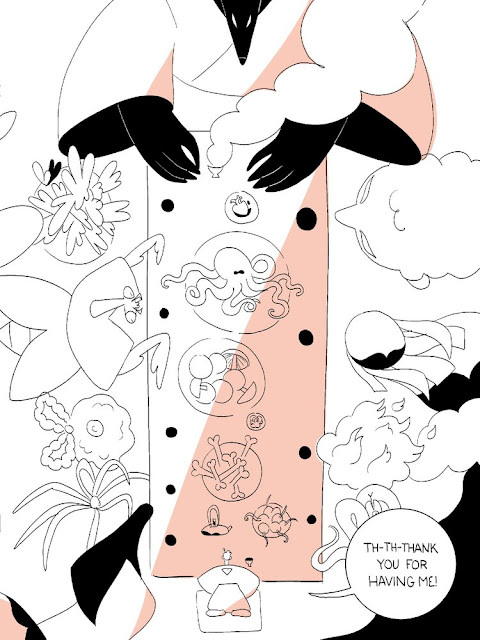 A final, subtle shade Salt gives her lead character comes in the form of a 12-panel page, with her filling in the entire page, running back towards reality. Each panel bears a separate shade of color, suggesting that all of her pieces are there, they just need filling in with a unified color. Perhaps this is a symbol of her unfinished state, how her mission of self-realization has only just begun. Or perhaps her pieces aren’t meant to be filled in at all. Is she running away from her demons, or running towards overcoming her fears? Salt’s dialogue here suggests the former. Then again, an answer more in-tune with Taemons may well be that there can never be a straightforward answer. Salt’s narration intertwines with the visuals to create something of a misleading march into the subconsciousness, landing in a place that provokes a vague atmosphere with no easy answers. Taemons is a thoughtful, bracing, stately introspection that delights in playing with perspective. It’s smart enough to offer no one easy interpretation of the questions it asks, leaving the reader to fill in the gaps. Salt’s strengths as an illustrator radiate throughout Taemons. The stripped-back approach to color and detail allows for a bold, eccentric structure that reflects the moods and ideas scattered throughout. Emotionally, Taemons acts like something akin to an outstretched hand, inviting you to explore our own inner demons. If your own journey is as sweetly-natured and oddly fun as Taemons, it will be worth the trip.